1-1/2" tall x 3/4" diameter. 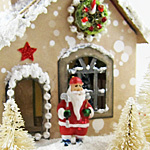 This item is not true dollhouse 1:12 scale. Made of sisal, wire, and wood. 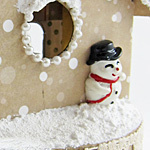 Putz House by Kristin Batsel using the Glitter Houses Add-On Kit; Supply List.